Modernizing an icon as the Lancia Stratos is no easy task and none other than original Bertone house could pull it off this impressively. Flashback 1970s. The new era kicked off with high hopes. The international rally scene was devoured by the fantastic handling Alpine-Renault A110 1600 hard chased by the equally amazing Porsche 911 S. These queens of hard terrain, all weather racing were getting old and a new replacement had to open the 70s era. While Lancia had already tremendous success with its fantastic Fulvia HF rally racer, the world demanded more power, more speed, more agility and none of it would be clothed as stunningly as the Lancia Stratos. Lancia Stratos. The Lancia Stratos HF otherwise simply known as the Lancia Stratos broke the mold in many ways. Form its prototype concept the Lancia Stratos Zero to the virtually untouched production presented at the 1971 Turin Motor Show, the Stratos sported the mid-central mounted Dino Ferrari V6 pushing out 192 hp, giving the car 0-60 mph shy of five seconds. That was back in 1974! As soon as the Stratos’ wheels met rubber, the championship was over. Lancia had won. The car won all three years international championship during 1974, ’75 and ’76. It also won the rally of them all, the Rallie de Monte Carlo 1975, ’76 and ’77. The race versions put out no less 280 hp, going as far up as 560 hp with a KKK turbocharger. No small thanks to Bertone’s insightful triangular design, the Stratos was and is still unlike any other rally racer today. After all, it was the first car designed from scratch for international rally competitions and the results were on par. So how do you modernize such an icon? You let the original coachbuilder take care of business. The Nuccio. To be fair, this iteration of the iconic Stratos is not the only one. A concept presented at the Geneva Auto Show in 2005 form the British design firm Fenomenon was penned by Christian Hrabalec. It eventually morphed into a product developed by Prodrive that sported a healthy 419 hp engine. 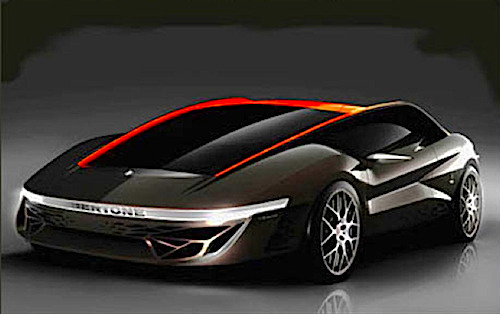 To celebrate the centenary of Bertone, the Italian coachbuilder struck a high note with the Nuccio, Bertone’s nickname. This project is the ultimate “extreme” sport design in the central-rear engine platform drivetrain. Designed by Michael Robinson at Bertone Style, the Nuccio keeps the legend alive with a short, low, wide and powerful look. Remember that the original Stratos Zero concept was 33” low, beating by 7 inches the legendary Ford GT 40. The Nuccio will be available here and there this year. After its official appearance at the Geneva Motor Show yesterday, it will then go on to parade at the Beijing Motor Show in April, Laguna Seca, USA in August, then finally rest at the National Automobile Museum of Turin in May. It will launch the anticipated exhibition that honors the rich history of the Bertone house that helped shape car elegance and passion. When it comes to performance, the Nuccio wouldn’t disappoint either with its perfect proportion dimensions. It measures 15’ and 74” in length, 6’ and 40” wide and 4’ feet high. It is powered by a 4.3L V8 delivering 480 hp, which would make this car fun to drive. Obviously, the fun would be best met on a track, as street driving could be hampered by modern day traffic and road condition constraints. Will we ever see a road version of the Nuccio? Probably not, however, the emotional appeal helps us remember that the Bertone house is not only well and alive but that can still produce inspiring concepts. This comes in at an important time when most classic coachbuilders have either closed doors or been swallowed into huge global carmaker’s portfolios. Only a few of them survive with enough capacity to still design and build stunning cars. The Nuccio Bertone excelled in doing the impossible, modernizing a classic.